On August 15 and 16, the Tough Mudder run will be set up on Long Island for the first time. If you’re ready to get your hands dirty as you put both your physical fitness and teamwork skills to the test, head on over to Old Bethpage for a day filled with mud, fun and outrageous obstacles! Imagine the obstacle course at your childhood summer camp on steroids and you’ll have an idea of what Tough Mudder entails. It’s a 10-12 mile course that’s designed to test the physical and mental resilience of its participants. Keep in mind, Tough Mudder is not a race. The satisfaction comes from completing it, not completing it quickly. Run the course alone or with a team. Either way, be prepared for a challenge. The Tough Mudder course is mainly full of grueling obstacles and many require some level of teamwork. The Mud Mile is exactly what it sounds like. It’s a one-mile track of waist-deep mud with high entrances and exits over which participants must climb. The Cry Baby is an enclosed structure filled with a safe tear gas-like substance through which participants will have to tearfully travel. The final obstacle on the Tough Mudder course is perhaps the most infamous. 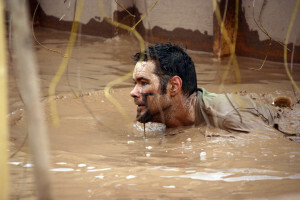 Electroshock Therapy is a stretch of muddy water with piles of mud to dive over. The catch is that there are electrically charged wires hanging from above, which will deliver an electric shock to anyone that comes in contact with them. However, not all obstacles are so painful. For example, Greased Lighting is basically a big waterslide, only a bit muddier. Tough Mudder has opportunities for volunteers to do a number of things. If you’d like to set up the event site, cheer on and motivate course participants or be part of Tough Mudder’s medical team, you can volunteer to do so. If you’re planning to run the obstacle course, ask your friends and family to sponsor you for a charity. Included at the Long Island event are the Wounded Warrior Project, the National Kidney Foundation and the Children of Peru Foundation. If you want to mix things up at your company, consider testing their strength and toughness with a corporate package. For kids between the ages of seven and 12, Tough Mudder offers a much less rigorous one-mile obstacle course. Featured in the Fruit Shoot Mini Mudder Course is the A-Frame Adventure, which has kids climb up and over a wooden a-frame with ropes. The final obstacle, Mount Mud, will challenge the young participants to climb over mountains of mud as they race to the finish. Spots for the Fruit Shoot Mini Mudder are available on-site on a first come, first serve basis. So whether you want to test your own grit, donate your pain to a good cause and raise money for a charity or spice up your office life, consider becoming a Mudder this year. Don’t wait too long to buy your ticket, though. The prices increase as Tough Mudder 2015 approaches. If you need a ride out to this grueling test of fortitude, call All Island at a location near you or make a reservation.